I love shopping online as much as anyone but it is costly and time consuming for a one woman business to have an online shop with all the bells and whistles so I have a more simple system which requires a little old fashioned connection between you, the customer and me, the shop owner. Sometimes it is nice to have this connection and for the sale not to be so sterile and anonymous. I certainly am much happier knowing that I have offered advice or answered questions or simply connected with you the customer as I would if you came to my market stall or home shop. My business could not exist without the internet and I have become proficient at using it to my advantage; whether I be looking for new products, ordering from farmers near and far, checking the latest prices for The Garden Shed and Pantry or receiving email orders from all over Australia. Send me an email with your requirements. I will reply with something like the email below. Once you have transferred money to my account and I have received it, your goods will be posted the same or the next day. Thanks you for your enquiry. Currently I have the 2 spice grinders in stock. They are available at the Cygnet Market OR at my home shop OR I can post them to you (anywhere in Australia) for an extra $10. 1. Please deposit $35 / spice grinder + $10 postage into my account. Quote your name as the reference. 2. Reply to this email telling me what you would like sent + your name and postal address + that you have paid. 3. Once I have received your payment and email I will post them off to you. October newsletter and Pat the TV star! Just arrived: first buckets of 2014 Jumbo kalamatas. 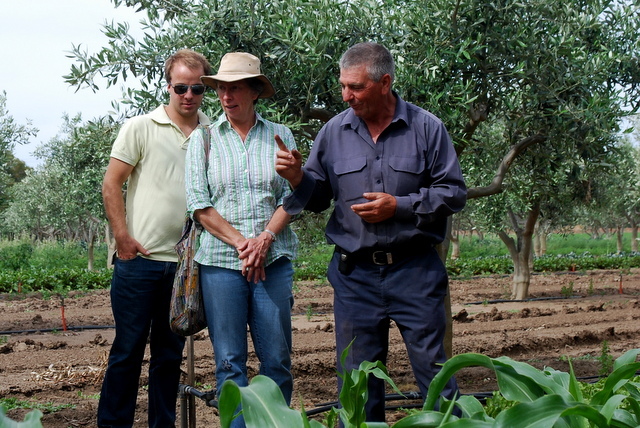 Pat and Lina naturally ferment the olives for several months (unlike shop olives that are chemically treated for speed). At every step of the way care is taken to keep to the old, Italian ways. 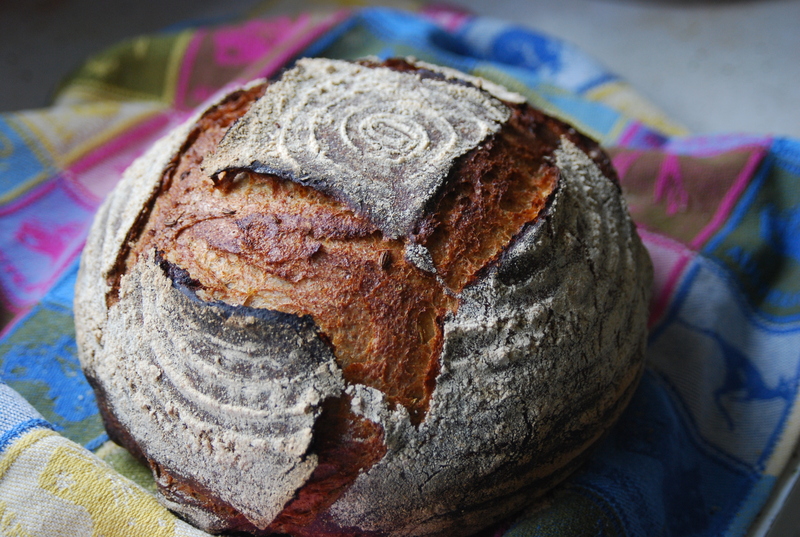 See below for news of Pat and Lina…..
Nov. Sourdough Workshop: It is always a joy having sourdough workshops in my kitchen as I know that everyone will go home happy, successful and confident to make many more wonderful, nutritious, delicious loaves. I now have a small supply of the perfect cast iron pots for baking your sourdough. Anyone who has done one of my workshops will be clambering to get one! Only taking 2 to the market. Please come and buy from me at home. $45. NEXT MARKET, THIS SUNDAY, OCTOBER 19TH, 10AM – 2PM. Pat and Lina, the olives and oils people, to star in TV show! 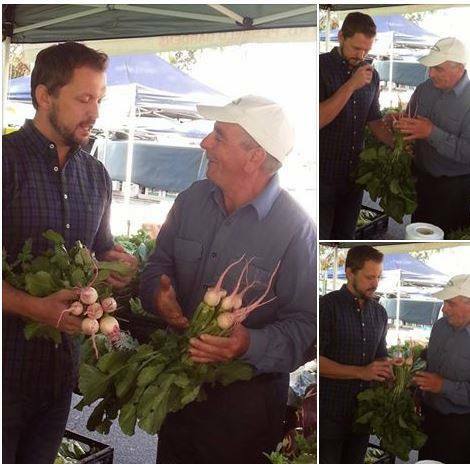 Everyone who goes to the Showgrounds Farmers’ Market in Adelaide knows that Pat and Lina have the best, most organic (uncertified these days) vegetables, olives and oils. Their stall spreads over 4 normal stall areas and out the front Pat spruiks his wares, whilst trimming garlic, arranging pumpkins or waving bunches of kale at queuing customers. 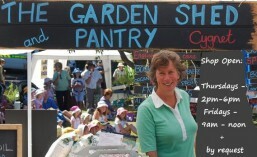 Everyone who enters the marquee has to pass by Pat, who is likely to offer advice on the vitality of fresh organic vegetables and answers your questions on how to cook them or grow them. They grow a lot of Italian things which are unfamiliar to some people but Pat has all the help you need. His quick wit and cheeky smile attract you immediately to him and he is the centre of focus while the queue slowly files through. Keeping his customers relaxed, educated and happy is important because sometimes the queues are long, so popular are the amazing array of vegetables, none of which has ever seen plastic, from seed to stall. No poly tunnels for Pat and he will tell you why….. all about the off-gassing of plastic and the horrors of plastic production and disposal. I love Pat! 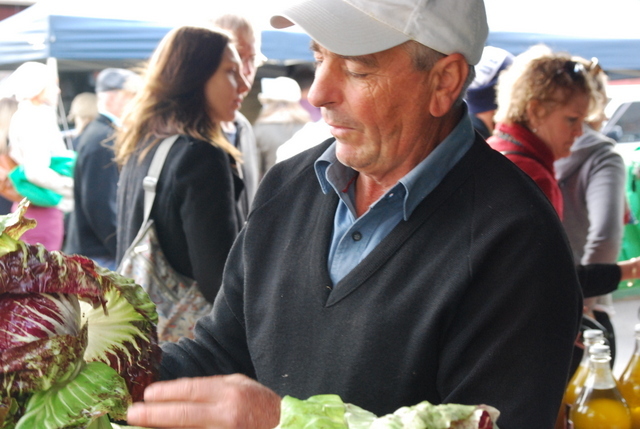 It is from Pat that I learnt about chicory, like the one he is holding in the photo below, that I took at his stall. Now my garden is a haven for all self sown chicories, which are the best winter greens I know and are soooo beautiful too with colours from lime green to.bright red. 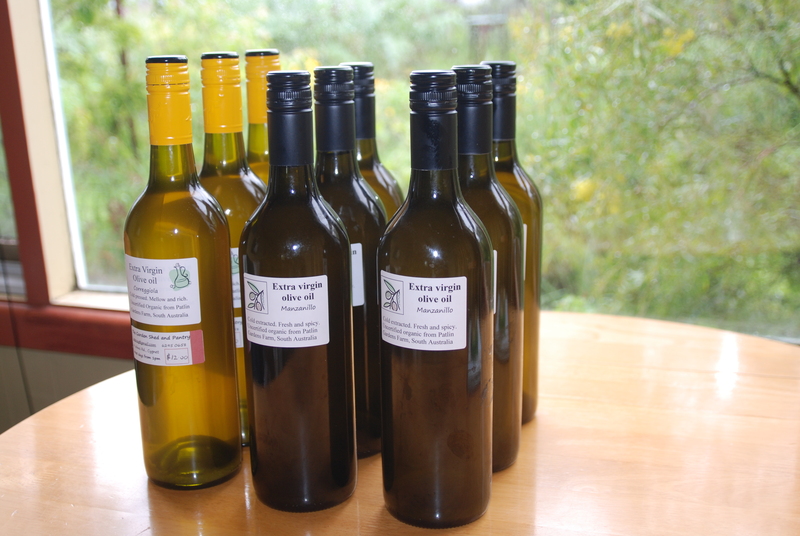 I sell Pat and Lina’s beautiful olive oils at a fabulous price because olives grow like weeds in the mediterranean climate of SA. Pat spruiking his chicories at the Showgrounds Farmers’ Market, Adelaide. Sourdough bread is the simplest bread to make. To learn how, come to my next workshop. The photo below is exactly what you will make in my kitchen with me. My next sourdough workshop is planned for November. For dates and bookings go to the booking sheet. For those who do not reside locally, I have a room for rent in my house. Find out more here. When you book the room in conjunction with the workshop, your partner or a friend may stay for free. If you would like to meet me please visit my stall on the stage at the next Cygnet Market, 1st and 3rd Sundays all year round. A full breakfast cooked by me; totally gluten free, guaranteed delicious and fabulously nutritious. No bird seed! All recipes and notes. Learn how cheap it is too; no expensive ingredients.